Dendritic cells (DCs) can induce and control host immune responses. DC subset-dependent functional specialties and their ability to display functional plasticity, which is mainly driven by signals via pattern recognition receptors, identify DCs as immune orchestrators. A pattern recognition receptor, Dectin-1, is expressed on myeloid DCs and known to play important roles in Th17 induction and activation during fungal and certain bacterial infections. In this study, we first demonstrate that human plasmacytoid DCs express Dectin-1 in both mRNA and protein levels. More interestingly, Dectin-1–activated plasmacytoid DCs promote Th2-type T cell responses, whereas Dectin-1–activated myeloid DCs decrease Th2-type T cell responses. Such contrasting outcomes of Th2-type T cell responses by the two DC subsets are mainly due to their distinct abilities to control surface OX40L expression in response to β-glucan. This study provides new insights for the regulation of host immune responses by Dectin-1 expressed on DCs. Dendritic cells (DCs) are major APCs that can induce and direct host immune responses toward immunity or tolerance (1). DCs express multiple pattern recognition receptors (PRRs), most notably TLRs and lectin-like receptors (LLRs), which can bridge innate to adaptive immune responses (2–6). LLRs generally operate as constituents of the powerful Ag capture and uptake system. However, certain LLRs also display unique functions in shaping the type of host immune responses. Most notably, Dectin-1 recognizes fungal and bacterial β-glucan and plays an important role in the induction and activation of Th17 responses (7–9). DC asialoglycoprotein receptor also has a unique ability to promote the induction and activation of Ag-specific regulatory T cells (10). These features, Ag capture and uptake, as well as capacity for initiating activation signals, identify these LLRs as key immune receptors that can impact the overall outcome of host immune responses by determining the types of CD4+ T cell responses. Critical functions of different types of CD4+ T cells in both healthy and disease states have been relatively well studied (11, 12). Th1 is important for protective immunity against intracellular pathogens, as is Th2 against parasites and Th17 against fungal and certain bacterial infections. In addition, Th2-mediated inflammation is not only associated with multiple types of allergic diseases (13–15), but also with the pathology of fungal and bacterial infections (16, 17), whereas Th1 and Th17 provide hosts with protective immunity against such pathogens (17–19). Therefore, the discovery of unknown pathways by which DCs can regulate Th2-type CD4+ T cell responses is critical for the rational design of vaccines or immunotherapeutics that can prevent or cure such Th2-associated diseases. Human Dectin-1 (hDectin-1) is known to be expressed on monocytes, macrophages, and myeloid DCs (mDCs) (9, 20–22). Unlike mouse Dectin-1 (mDectin-1), hDectin-1 is also expressed on B cells, neutrophils, and eosinophils (23). Therefore, hDectin-1 is not myeloid restricted. In this regard, we reinvestigated hDectin-1 expression on plasmacytoid DCs (pDCs), although previous studies (22, 24) reported that human pDCs do not express Dectin-1. We found that human pDCs express functional Dectin-1. More importantly, Dectin-1 expressed on pDCs and mDCs display opposing functions to regulate Th2-type T cell responses. Blood from healthy volunteers, spleens from chronic pancreatitis patients undergoing total pancreatectomy and splenectomy, and tonsils from tonsillectomy patients were acquired under protocols approved by the Institutional Review Board of Baylor Research Institute. PBMCs from healthy volunteers were isolated by density gradient centrifugation using Ficoll-Paque PLUS (GE Healthcare). Single-cell suspensions of tonsils and spleens were used. Blood mDCs and pDCs were enriched using the panDC enrichment kit (StemCell Technologies) and then sorted by FACSAria (BD Biosciences) (purity >99.5%). Autologous total CD4+ T cells were purified using the EasySep Human CD4+ T Cell Enrichment Kit (StemCell Technologies). Allogeneic naive CD4+ T cells (CD45RA+CD45RO−CCR7+) were enriched and FACS sorted. Culture medium consisted of RPMI 1640 (Life Technologies) supplemented with HEPES buffer, 2 mM l-glutamine, 1% nonessential amino acids, sodium pyruvate, 50 U/ml penicillin, 50 μg/ml streptomycin, and 10% normal human serum AB (GemCell). L cells and L cells expressing OX40L (OX40L-L) were cultured in complete RPMI 1640 containing 10% FCS and 600 ng/ml geneticin (Life Technologies). Monocyte-derived IL-4 DCs and IFN DCs were generated as previously described (20). Anti–Dectin-1 (MAB1859; R&D Systems) and anti–Dectin-1 (15E2; in house) (9, 20) were used for measuring surface hDectin-1 expression. Anti–Dectin-1 (clone 259931; R&D Systems) (25) was used to block hDectin-1. For DCs, anti–HLA-DR (L243), anti-CD123 (9F5), anti-CD11c (B-ly6), and Lin-1 from BD Biosciences were used. Anti–CD80-PE (2D10.4; eBioscience), anti-CD83-allophycocyanin (HB15e; BioLegend), anti–CD86-Pacific Blue (2331; BD Biosciences), and anti–CD40-FITC (5C3; eBioscience) were used to measure DC activation and maturation. Annexin V (BioLegend) staining was performed to test cell viability. Anti-Flag Ab was purchased from Sigma-Aldrich. Anti-CD4 (RPA-T4), anti-CD45RA (HI100), anti-CD45RO (UCHL1), and anti-CCR7 (150503) from BD Biosciences were used. For intracellular cytokine staining, anti–IFN-γ (B27), anti–IL-17 (BL168), anti–IL-13 (JES10-5A2), and anti–IL-5 (JES1-39D10) from BioLegend were used. GolgiPlug was purchased from BD Biosciences. CFSE (Molecular Probes) was used for measuring CD4+ T cell proliferation. Surface OX40L expression was measured using anti-OX40L (ik-1; BD Biosciences) and neutralizing anti-OX40L (made in house by Dr. Hori). Anti–IFN-α (PBL Assay Science) and anti–IL-10/IL-10R (in house) were used to neutralize IFN-α and IL-10, respectively. LPS-free curdlan (Wako Chemicals) was used. Piceatannol was purchased from Sigma-Aldrich. R848 and CpG-B were purchased from Invivogen. Recombinant fusion proteins of Ab and either hemagglutinin 1 (HA1) or HA1-derived peptides were prepared as previously described (9). Cytokine and chemokine levels in culture supernatants were measured by multiplex bead-based assay (Bio-Rad). A total of 1 to 2 × 105 purified pDCs/well in complete RPMI 1640 (Life Technologies) containing 10% human AB serum were cultured overnight in 96-well plates with 100 μg/ml curdlan, 500 ng/ml R848, or 100 nmol CpG-B. pDCs were stained with the Abs indicated, and the expression levels of costimulatory molecules were measured by flow cytometry (FACSCalibur; BD Biosciences). The amounts of IL-6, TNF-α, IL-10, IFN-α, IP-10, MIP-1α, MIP-1β, and IL-8 in the culture supernatants were measured by multiplex bead-based assay (Bio-Rad). To block curdlan binding to hDectin-1, pDCs were pretreated with 20 μg/ml anti–hDectin-1 (clone 259931; R&D Systems) and then incubated overnight with 100 μg/ml curdlan. To inhibit spleen tyrosine kinase (Syk), pDCs were treated with 1 μmol R406 for at least 1 h before adding curdlan. The amount of IL-6 in culture supernatants was measured by ELISA (R&D Systems). In some experiments, 10 μg/ml anti–IFN-α, anti–IL-10/IL-10R, or control Abs was added into the cultures. To test whether curdlan could induce pDCs to express cysteinyl leukotriene (Cys-LT), FACS-sorted pDCs (1 × 105/well) were cultured for 1 h in the presence or absence of 100 μg/ml curdlan. Lyophilized extract of Dermatophagoides farinae (Greer) was used as a positive control (26, 27). The amount of Cys-LT in the culture supernatants was measured by enzyme immunoassay according to the manufacturer’s protocol (Cayman Chemical) with a lower limit of detection at 34 pg/ml. In the T cell induction experiments, purified allogeneic naive CD4+ T cells (1 to -2 × 105) were cocultured either unstimulated, or with curdlan-stimulated (100 μg/ml) DCs (5–10 × 103) for 7 d. T cells were then restimulated for 5 h with PMA/ionomycin (Sigma-Aldrich) in the presence of GolgiPlug (BD Biosciences), followed by intracellular cytokine staining. T cells were also incubated for 48 h with PMA/ionomycin, and culture supernatants were used for measuring cytokine levels. To block OX40L expression on DCs, 20 μg/ml anti-OX40L Ab was used. The same amount of IgG2a was used as a control. In the experiment testing HA1-specific memory CD4+ T cell responses, purified total CD4+ T cells (1 to 2 × 105) were cocultured for 7 d with 1 to 2 μg/ml anti–hDectin-1–HA1 in the presence or absence of 100 μg/ml curdlan. T cells were restimulated for 48 h with preselected HA1-derived peptides. Cytokine levels in the supernatants were measured. Intracellular cytokine expression was assessed after 5-h stimulation with PMA/ionomycin. In some experiments, γ-irradiated OX40L-L cells and L cells (5 × 104/well) were seeded first, and then DCs and T cells were cocultured. RNA was isolated from DCs using the RNeasy Minikit (Qiagen). cDNA synthesis was performed using the SMART RACE Kit (BD Biosciences) with oligo(dT) primers (Sigma-Aldrich), as described by the manufacturer. Dectin-1 isoforms were amplified by PCR from the cDNA using the following 5′ and 3′ primers, respectively: 5′- GCTATATCTATTCAGGGGCTCTCAAGAACAATG-3′ and 3′- CCTCACATATTTCTCTCTCCTTCTCCACCCTTCCTC-5′. PCR products were separated by electrophoresis on a 1.0% (w/v) agarose gel and purified by means of a QIAquick PCR Purification Kit (Qiagen). The isoforms were cloned into pCR4-TOPO3.1 vector (Invitrogen) and sequenced by TACgen. Sequences were submitted to GenBank under the following accession numbers (http://www.ncbi.nlm.nih.gov/Sequin/acc.html): AF400595 (βGRA), AF400596 (βGRB), AF400597 (βGRC), AF400598 (βGRD), AF400599 (βGRE), AF400600 (βGRF), AF400601 (βGRG) and AF400602 (βGRH). Statistical significance was determined using the ANOVA test or t test using Prism 5 software (GraphPad Software). We measured the surface expression level of hDectin-1 on pDCs (HLA-DR+Lin−CD11c−CD123+) and compared it with that of myeloid DCs (mDCs, HLA-DR+Lin−CD11c+CD123−) from blood, tonsil, and spleen (Fig. 1). Fig. 1A shows that pDCs in PBMCs from healthy donors expressed surface hDectin-1, but the expression level of hDectin-1 on pDCs was lower than that on mDCs from the same donor. pDCs from tonsil (Fig. 1B) and spleen (Fig. 1C) also expressed surface hDectin-1, but with decreased levels compared with those of mDCs from the same tissues. Summarized data from experiments using samples from different donors further indicate that both pDCs and mDCs from blood, tonsil, and spleen expressed hDectin-1, but the expression level of hDectin-1 was lower on pDCs than on mDCs (Fig. 1D). Interestingly, pDCs from the blood expressed a higher level of hDectin-1 than pDCs from tonsil or spleen. However, mDCs from all three tissue compartments expressed similar levels of hDectin-1. Therefore, surface expression of hDectin-1 in the two DC subsets could be controlled by different mechanisms. Flow cytometry data were further verified in RNA levels. RNA from FACS-sorted pDCs (purity >99.5%) was extracted, and RT-PCR analysis was performed. RNA from mDCs of the same donors, as well as in vitro–cultured monocyte-derived IL-4 DCs and IFN DCs, were also tested (Supplemental Fig. 1A). Both in vitro and in vivo DCs expressed three major hDectin-1 transcripts designated as long, medium, and short. Schematic diagrams of the three hDectin-1 isoforms (A, B, and D) (28) based on the deduced amino acid sequences are presented (Supplemental Fig. 1B) based on their sequence analysis (Supplemental Fig. 2). Taken together, pDCs express hDectin-1, although the surface expression level of hDectin-1 is lower on pDCs than on mDCs. Human pDCs from the blood, tonsil, and spleen express Dectin-1. (A) pDCs and mDCs from the blood of healthy donors were stained with anti–Dectin-1 mAb. pDCs and mDCs from tonsil (B) and spleen (C) were stained with anti–Dectin-1 mAb. (D) Summary for hDectin-1 expression on pDCs (left panel) and mDCs (right panel) from blood, tonsil, and spleen. Each dot represents data from a single donor. Mean fluorescence intensity (MFI) of isotype control Ab was subtracted. We next explored the biological function of hDectin-1 that is expressed on pDCs by testing whether β-glucan could activate pDCs. Fig. 2A shows that overnight treatment of pDCs with curdlan improved viability. Both R848 and CpG-B also enhanced pDC viability. Cells gated in Fig. 2A were further analyzed by Annexin V staining (Fig. 2B). pDCs treated with curdlan, R848, or CpG-B showed lower Annexin V staining than untreated pDCs. Data from three independent experiments further confirms that curdlan promoted pDC viability, as did both R848 and CpG-B (Fig. 2C). hDectin-1 ligation by β-glucan activates pDCs via Syk. pDCs from blood were cultured overnight in the presence of none, curdlan, R848, or CpG-B. (A) Forward light scatter (FSC) and side scatter (SSC) scatter gram of pDCs. (B) Annexin V staining of cells gated in (A). (C) Summary of three independent experiments of (A) and (B). Error bars represent SD. (D) Expression levels of CD80, CD83, CD86, HLA-DR, and CD40 were measured. (E) Cytokine and chemokine levels. (F) pDCs were treated with a Syk inhibitor, R406, for 1 h and then cultured overnight with 100 μg/ml curdlan. The amount of IL-6 in the culture supernatants was assessed. (G) pDCs were treated with 20 μg/ml anti–hDectin-1 Ab and then incubated overnight with 100 μg/ml curdlan. The amount of IL-6 in the culture supernatants was measured. In (E)–(G), error bars represent SD of triplicate assays. Two independent experiments showed similar results. (H) The amount of Cys-LT secreted from pDCs stimulated with curdlan or house dust mite D. farinae (Df) extract. FACS-sorted pDCs from two healthy donors were tested in duplicate assays (mean ± SD). Ctrl, control. pDCs treated with curdlan also upregulated surface CD80, CD83, CD86, HLA-DR, and CD40 expression (Fig. 2D, left panel), as did R848 (Fig. 2D, middle panel) and CpG-B (Fig. 2D, right panel). However, R848 and CpG-B were more effective than curdlan for CD80, CD83, and CD86 upregulation. Fig. 2E shows that curdlan-treated pDCs secreted IL-6, TNF-α, IP-10, MIP-1α, MIP-1β, and IL-8 in a curdlan dose-dependent manner. However, R406, a Syk inhibitor, decreased the amount of IL-6 secreted from curdlan-treated pDCs (Fig. 2F). This suggests that pDC activation via hDectin-1 is largely dependent on Syk (3, 29). Fig. 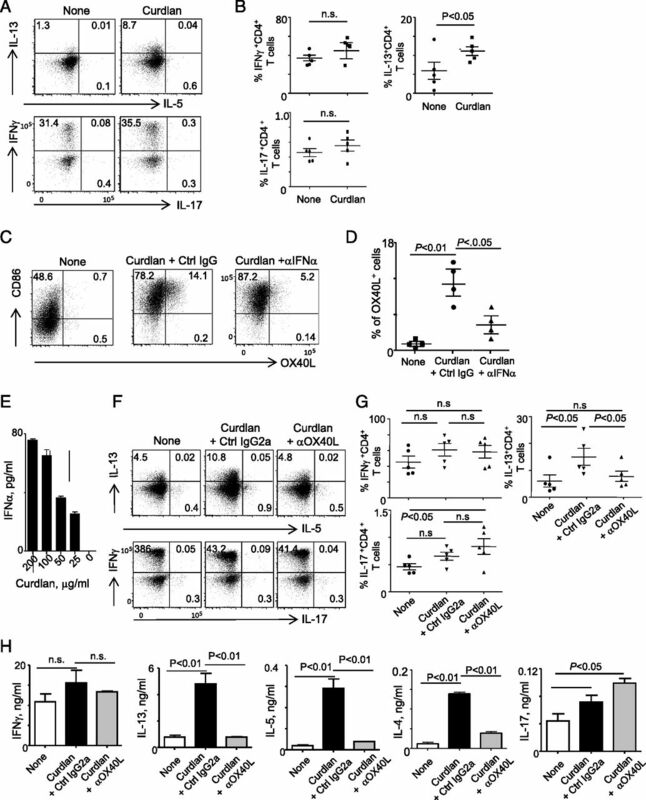 2G shows that curdlan-induced IL-6 secretion from pDCs was inhibited by an anti–Dectin-1 Ab, as previously demonstrated for the specificity of curdlan binding to Dectin-1 expressed on myeloid cells (30, 31). Taken together, we conclude that the hDectin-1 expressed on pDCs is functional. Ligation of hDectin-1 with curdlan results in the activation of pDCs via Syk, followed by enhanced viability, phenotype maturation, and cytokine and chemokine secretion. However, curdlan treatment on pDCs did not induce Cys-LT secretion (Fig. 2H), although house dust mite D. farinae extract stimulated pDCs to secrete increased amounts of Cys-LT, which can drive Th2 responses (27, 32). We investigated intracellular cytokine expression in CD4+ T cells primed with curdlan-treated pDCs or with untreated pDCs. Compared to untreated pDCs, curdlan-treated pDCs induced greater IL-13+CD4+ T cell responses (Fig. 3A, top panel). Summarized data from four independent experiments performed with cells from different donors are presented in Fig. 3B. We next observed that fractions of curdlan-treated pDCs, particularly CD86high pDCs, expressed increased surface OX40L, which plays critical roles in Th2-driven inflammatory diseases (13–15). This curdlan-induced upregulation of OX40L was blocked by anti–IFN-α Ab (Fig. 3C, 3D), although the amount of IFN-α secreted from curdlan-treated pDCs was <100 pg/ml (Fig. 3E). The expression of Th2 cytokines by T cells primed with curdlan-treated pDCs was inhibited by anti-OX40L Ab (Fig. 3F, top panel). Blocking OX40L slightly decreased IFN-γ+CD4+ T cell responses, but it did not greatly alter IL-17+CD4+ T cell responses (Fig. 3F, bottom panel). 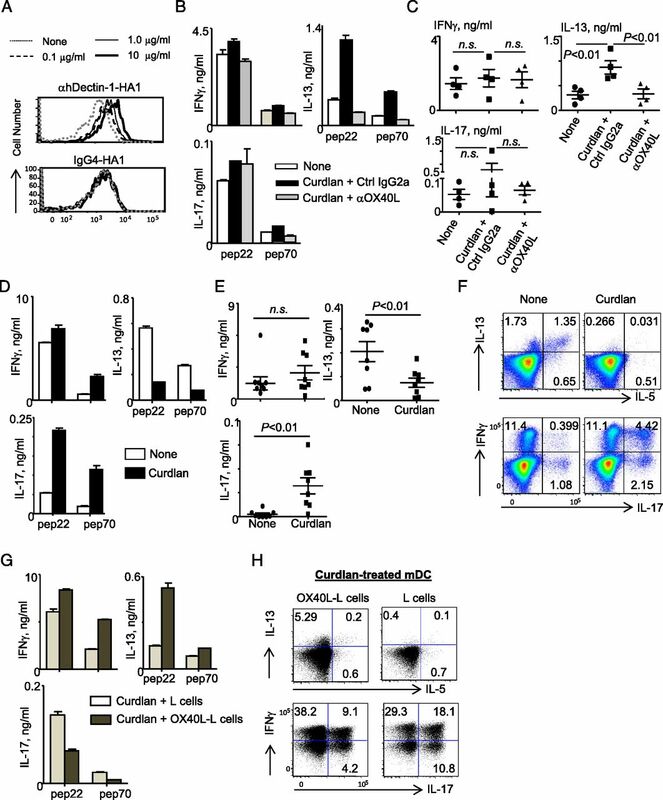 Data from five independent experiments using pDCs from different donors further confirm that curdlan-treated pDCs promoted Th2-type T cell responses by upregulating surface OX40L expression (Fig. 3G). Curdlan-treated pDCs enhanced Th17 induction only when OX40L was blocked. In line with the intracellular cytokine expression data, naive CD4+ T cells primed with curdlan-treated pDCs secreted more of both IL-13 and IL-5, as well as IL-4, than did naive CD4+ T cells primed with untreated pDCs (Fig. 3H). Such increased secretion of Th2 cytokines was not observed when OX40L was blocked by anti-OX40L Ab. Neither IFN-γ nor IL-17 level was significantly altered by curdlan treatment alone. However, CD4+ T cells primed with curdlan-treated pDCs in the presence of anti-OX40L Ab secreted a greater amount of IL-17 than did CD4+ T cells primed with untreated pDCs. Supplemental Fig. 3A demonstrates that curdlan-activated pDCs promoted IL-13 single-positive as well as IL-13+IFN-γ+ and IL-13+IL-17+ CD4+ T cell responses. Taken together, we conclude that hDectin-1–activated pDCs upregulated surface OX40L expression, which was followed by enhanced Th2 induction as well as Th2 cytokine expression by CD4+ T cells. Curdlan-induced upregulation of surface OX40L was mainly due to the action of the IFN-α. 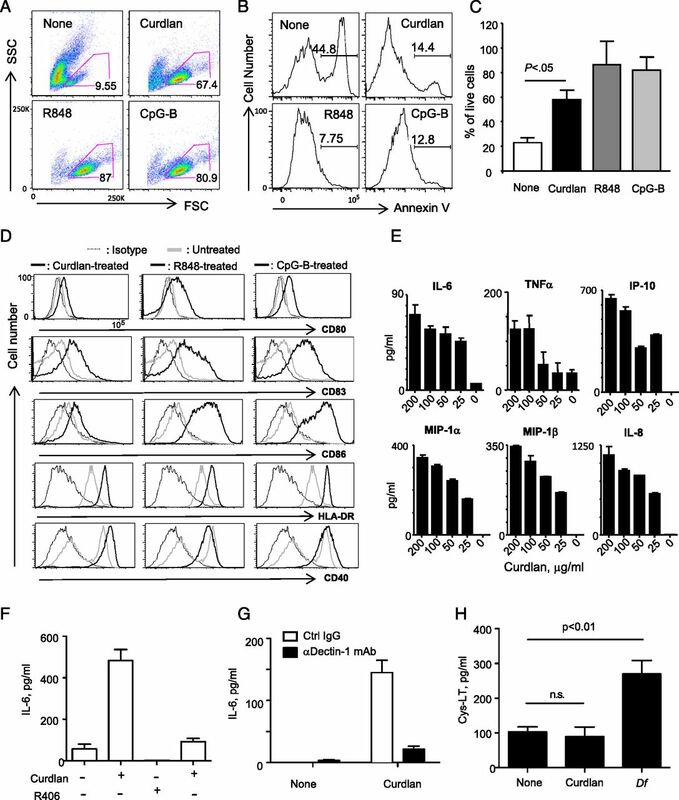 hDectin-1–activated pDCs promote Th2 induction and Th2-type cytokine secretion by CD4+ T cells. (A) Allogeneic naive CD4+ T cells were cocultured for 7 d with untreated or curdlan-treated blood pDCs. Intracellular cytokine expression, IL-13 and IL-5 in the top panel and IFN-γ and IL-17 in the bottom panel, during stimulation with PMA/ionomycin were measured. (B) Summary of data in experiment (A) performed with cells from different donors. (C) Surface OX40L expression on pDCs cultured overnight in medium alone or in the presence of either curdlan and control (Ctrl) IgG or curdlan and anti–IFN-α Ab. Cells were also stained with anti-CD86 Ab. (D) Summary of data in experiment (C) performed with cells from different donors. (E) The amount of IFN-α secreted from blood pDCs cultured overnight with the indicated amounts of curdlan. Error bars indicate SD of triplicate assays. Two separate experiments showed similar results. (F) Allogeneic naive CD4+ T cells were cocultured for 7 d with untreated pDCs or curdlan-treated pDCs in the presence of control IgG or anti-OX40L Ab for 7 d. Intracellular IL-13 and IL-5 (top panel), as well as IFN-γ and IL-17 (bottom panel), during stimulation with PMA/ionomycin were measured. (G) Summary of data in (F) from five independent experiments. (H) Cytokines secreted from T cells (E) during 48-h restimulation with PMA/ionomycin. Error bars indicate SD of triplicate assays. Two independent experiments showed similar results. ANOVA for (B), (D), and (G) and t test for (H) were used for testing statistical significance of the data. Based on the data (Fig. 3) of curdlan-treated pDCs, we speculated whether activation of mDCs via hDectin-1 could also result in altered Th2 induction. Fractions of mDCs cultured with allogeneic CD4+ T cells expressed OX40L, as previously demonstrated (33). These OX40L+ mDCs also expressed an increased level of CD86 (Fig. 4A, left panel). In contrast to the results of hDectin-1–activated pDCs, we found that curdlan treatment decreased surface expression of OX40L on mDCs (Fig. 4A, middle panel). In addition, anti–IL-10/IL-10R Abs inhibited curdlan-induced downregulation of surface OX40L expression on mDCs (Fig. 4A, right panel). Four independent experiments using FACS-sorted mDCs from different donors further demonstrated that curdlan suppressed OX40L expression on activated mDCs (Fig. 4B). This suppression was largely dependent on IL-10 secreted from the curdlan-treated mDCs (Fig. 4B, 4C). Blocking IL-6 or IL-1β secreted from the curdlan-treated mDCs did not significantly alter the surface expression level of OX40L on the curdlan-treated mDCs (not shown). hDectin-1–activated mDCs decrease Th2 induction and Th2-type cytokine secretion by CD4+ T cells. (A) Blood mDCs were cultured overnight in medium alone or either in the presence of curdlan and control (Ctrl) IgG or curdlan and anti–IL-10/IL-10R. Cells were stained with anti-CD86 and anti-OX40L Abs. (B) Summarized data of (A) from four independent experiments using cells from different donors. (C) Levels of IL-10 secreted from mDCs cultured overnight with the indicated amounts of curdlan. Error bars indicate SD of triplicate assays. Two independent experiments showed similar results. (D) Allogeneic naive CD4+ T cells were cocultured for 7 d with untreated pDCs and curdlan-treated pDCs (left panels) in the presence of control IgG or anti-OX40L Ab (right panels). T cells were stained for intracellular IL-13/IL-5 (top panels) as well as IFN-γ/IL-17 (bottom panels) expression during stimulation with PMA/ionomycin. (E) Summarized data of experiment (D) performed with cells from different donors. (F) Cytokines secreted from T cells (E) during 48-h restimulation with PMA/ionomycin. Error bars indicate SD of triplicate assays. Two independent experiments showed similar results. ANOVA for (B) and (E) and t test for (F) were used for testing statistical significance of the data. In line with the decreased OX40L expression, mDCs treated with curdlan decreased IL-13+CD4+ T cell induction (Fig. 4D, top left panel). Treatment of mDCs with curdlan also decreased IFN-γ+CD4+ T cell responses but subsequently increased IL-17+CD4+ T cell responses (Fig. 4D, bottom left panel). Similar to the effect of curdlan treatment, blocking OX40L decreased IL-13+CD4+ T cell induction (Fig. 4D, top right panel), but increased IL-17+CD4+ T cell induction (Fig. 4D, bottom right panel). Data from five independent experiments using mDCs from different donors (Fig. 4E) confirmed that mDCs treated with curdlan decreased Th2-type T cell responses and that this was mainly due to the action of IL-10 followed by the downregulation of surface OX40L expression. CD4+ T cells primed with curdlan-treated mDCs secreted less IFN-γ, IL-13, IL-5, and IL-4 but more IL-17 than CD4+ T cells primed with untreated mDCs (Fig. 4F). Blocking OX40L gave similar results to those observed with CD4+ T cells primed with curdlan-treated mDCs. Supplemental Fig. 3B demonstrates that curdlan-activated mDCs decreased IL-13 single-positive and IL-13+IFN-γ+ CD4+ T cell responses. We therefore conclude that activation of mDCs via hDectin-1 downregulates surface OX40L expression on activated mDCs followed by decreased Th2 induction as well as Th2 cytokine secretion by T cells. IL-10 secreted from curdlan-treated mDCs downregulate surface OX40L expression on the activated mDCs. Blocking IL-10 in the cocultures of curdlan-activated mDCs and T cells resulted in increased IFN-γ+, IFN-γ+IL-13+, and IFN-γ+IL-17+ CD4+ T cell responses (Supplemental Fig. 4). To test the Ag-specific memory CD4+ T cell responses elicited by hDectin-1–activated pDCs, we used a recombinant fusion protein, consisting of influenza virus (H1N1 PR8) HA (anti–hDectin-1–HA1) fused to the Fc region of anti–hDectin-1 (15E2) (9). We previously showed that anti–hDectin-1 (15E2) did not compete with curdlan to bind to hDectin-1 (20). Fig. 5A shows that anti–hDectin-1–HA1, but not control IgG4-HA1, could bind to pDCs in a dose-dependent manner. Autologous CD4+ T cells were cocultured for 7 d with pDCs loaded with 1 μg/ml anti–hDectin-1–HA1. T cells were then restimulated for 48 h with preselected HA1-derived peptides: pep22 as a positive control and pep70 as a negative control (9, 10). As shown in Fig. 5B, pDCs loaded with anti–hDectin-1–HA1 were able to activate HA1-specific IFN-γ–, IL-13–, and IL-17–producing memory CD4+ T cell responses. However, pDCs treated with curdlan greatly enhanced HA1-specific IL-13–producing CD4+ T cell responses. These enhanced HA1-specific memory Th2 responses were blocked by anti-OX40L Ab. Data from four independent experiments are summarized in Fig. 5C. Taken together, we conclude that hDectin-1–activated pDCs promoted Ag-specific memory Th2 responses, and this was largely dependent on the surface OX40L expressed on the curdlan-treated pDCs. hDectin-1–activated pDCs and mDCs increase and decrease influenza virus–specific memory Th2 responses, respectively. (A) Binding of anti–hDectin-1–HA1 fusion protein to pDCs. Purified pDCs were incubated for 15 min with the indicated amounts of anti–hDectin-1–HA1 or control IgG4-HA1. Cells were further stained with anti-human IgG-FITC and sorted by FACS. (B) Autologous CD4+ T cells were cocultured for 7 d with 2 μg/ml anti–hDectin-1–HA1-loaded pDCs in the presence or absence of curdlan plus anti-OX40L or curdlan plus control (Ctrl) IgG. T cells were then restimulated with 1 μM HA1-derived peptides for 48 h. Cytokine levels in the culture supernatants were measured. Error bars indicate mean ± SD of triplicate assay. (C) Summarized data of experiment (B) performed with cells from four different donors. Statistical significance was tested with ANOVA. (D) Autologous CD4+ T cells were cocultured for 7 d with 2 μg/ml anti–hDectin-1–HA1-loaded mDCs in the presence or absence of curdlan. Cytokines secreted from T cells stimulated with PMA/ionomycin were assessed. (E) Summarized data of experiment (D) performed with cells from different donors. Statistical significance was tested with ANOVA. (F) Intracellular cytokine expression of total CD4+ T cells restimulated for 5 h with PMA/ionomycin in (D); IL-13 and IL-5 (top panel) and IFN-γ and IL-17 (bottom panel). (G) CD4+ T cells were cocultured for 7 d with 2 μg/ml anti–hDectin-1–HA1-loaded and curdlan-treated mDCs in the presence of γ-irradiated L cells or OX40L-L cells. Cytokines secreted from T cells stimulated for 48 h with 1 μmol indicated peptides were assessed. Error bars indicate SD of triplicate assays. Two repeat experiments showed similar results. (H) Intracellular cytokine expression (IL-13/IL-5 in the top panel and IFN-γ/IL-17 in the bottom panel) of T cells in (G) during 5-h restimulation with PMA/ionomycin. In contrast to the curdlan-treated pDCs, Curdlan-treated mDCs decreased HA1-specific IL-13–producing memory CD4+ T cell responses while enhancing HA1-specific IL-17–producing memory CD4+ T cell responses (Fig. 5D) (7–9). Similar observation for both IL-4– and IL-5–secreting HA1-specific responses were made (not shown). Data from four independent experiments using cells from different donors confirmed that curdlan-treated mDCs decreased HA1-specific Th2 but increased Th17 memory CD4+ T cell responses (Fig. 5E). Fig. 5F further shows that a significant percentage of the CD4+ T cells cultured with untreated mDCs expressed IL-13 and IL-5 in response to PMA/ionomycin. However, curdlan-treated mDCs decreased the percentage of IL-13+, IL-13+IL-5+, and IL-5+ CD4+ T cells. Curdlan-treated mDCs also enhanced IL-17+, particularly IL-17+IFN-γ+, CD4+ T cell responses. To test whether the decreased Th2 and increased Th17 memory responses by curdlan-treated mDCs (Fig. 5D–F) were due to decreased OX40L expression on mDCs. CD4+ T cells were cocultured with curdlan-treated mDCs in the presence of either L cells or OX40L-L cells (Fig. 5G). Compared to T cells cultured in the presence of L cells, T cells cocultured with curdlan-treated mDCs in the presence of OX40L-L cells secreted an increased amount of IL-13 but a decreased amount of IL-17, suggesting that OX40L contributed to the enhanced HA1-specific Th2 but decreased Th17 memory CD4+ T cell responses. We further measured intracellular cytokine expression by T cells during a 5-h restimulation with PMA/ionomycin (Fig. 5H). OX40L-L cells in the cocultures of CD4+ T cells and curdlan-treated mDCs increased IL-13+CD4+ T cell responses, but decreased IL-17+CD4+ T cell responses. 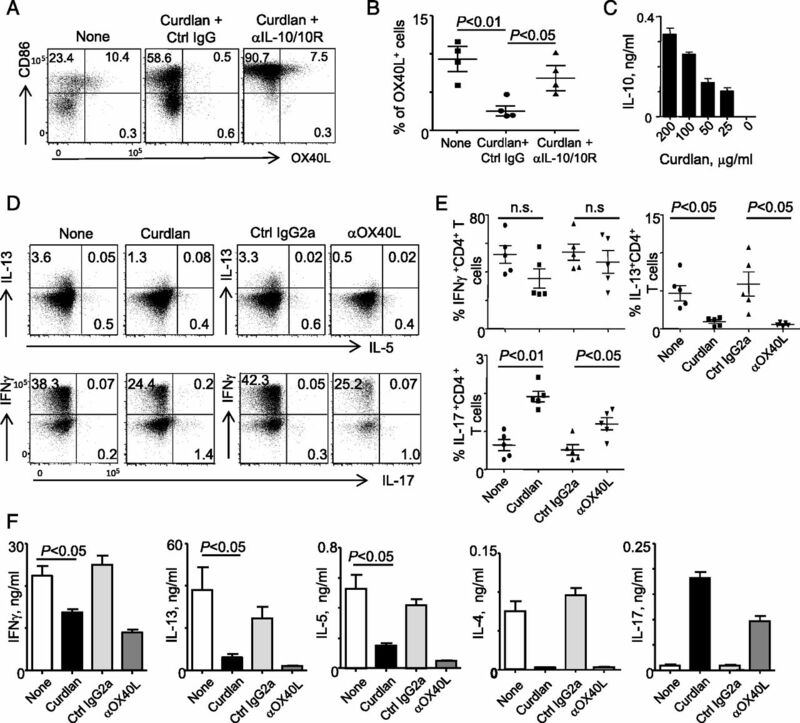 OX40L-L cells decreased both IL-17+IFN-γ+ and IL-17+IFN-γ− CD4+ T cell responses. Although curdlan-treated mDCs decreased both IL-13+ and IL-5+ total CD4+ T cell responses, addition of OX40L-L cells in the cocultures of CD4+ T cells and curdlan-treated mDCs did not promote IL-5+CD4+ T cell responses. We therefore conclude that activation of mDCs via hDectin-1 decreased Ag-specific memory Th2 responses. Curdlan-induced downregulation of surface OX40L on mDCs played an important role in the decreased Th2 and increased Th17 memory CD4+ T cell responses. This study reports that Dectin-1 expressed on pDCs and mDCs display opposing roles in the induction and activation of human Th2-type CD4+ T cell responses. hDectin-1–activated pDCs promote Th2 responses by the upregulation of surface OX40L expression through the action of IFN-α. In contrast, hDectin-1–activated mDCs decrease Th2 responses by the downregulation of surface OX40L expression through the action of IL-10. In consideration of the fundamental roles of DCs in host immune responses, our findings provide new insights into the regulation of host immune responses both in healthy and in diseases, particularly in the context of the presence of hDectin-1 ligands. pDCs are one of the major DC subsets in humans, and they play important roles in host immunity (34) as well as in the pathogenesis of multiple autoimmune and inflammatory diseases (35). We found that pDCs from blood, spleen, and tonsil expressed hDectin-1. Interestingly, pDCs from blood expressed greater levels of hDectin-1 than did pDCs from spleens or tonsils. This suggests that surface expression level of hDectin-1 on pDCs could be regulated in a tissue-specific manner. In contrast, however, previous studies reported that pDCs from blood did not express hDectin-1, as assessed by staining pDCs with anti–hDectin-1 Abs (22, 24). The specificity of anti–hDectin-1 mAb (15E2) used in this study was characterized in our previous studies (9, 20). We further demonstrated that pDCs express different isoforms of hDectin-1. Along with the data from previous studies (9, 20–23), we concluded that hDectin-1 is not myeloid restricted. Unlike mDectin-1, hDectin-1 is also known to be expressed on B cells, neutrophils, and eosinophils (23), although the biological functions of Dectin-1 expressed on certain cell types (e.g., neutrophils) are still controversial (36, 37) and need to be further studied. Murine pDCs were reported to express Dectin-1 (38), but their biological functions remain unknown. In contrast to mDectin-1, hDectin-1 mRNA is alternatively spliced, resulting in two major (A and B) and six minor (C to H) isoforms (21, 28, 39). This study also demonstrated that human pDCs express both isoforms A and B as well as isoform D, carrying an altered carbohydrate recognition domain encoded by exon 6. Isoform D has the same transmembrane region and cytoplasmic signaling domain that isoforms A and B have. Therefore, it would be important to find exogenous or endogenous ligands of this isoform in the future. Opposing roles of hDectin-1 expressed on the two DC subsets were mainly due to the subtypes’ distinct abilities to control surface OX40L expression in response to β-glucan. Signals via hDectin-1 upregulated OX40L expression on pDCs, but downregulated OX40L expression on mDCs. These contrasting outcomes were mainly driven by the actions of IFN-α and IL-10 secreted from pDCs and mDCs, respectively. OX40 (CD134) and its ligand, OX40 (CD252), are members of the TNF⁄TNFR superfamily (40). OX40 and OX40L are now considered prominent costimulatory molecules that can control T cell responses and thus impact many aspects of host immune responses. In particular, OX40-OX40L–mediated Th2 responses have been associated with the pathogenesis of multiple types of inflammatory diseases including allergy and autoimmune diseases (14, 40, 41). Th2 responses also strongly associate with pathology during fungal and certain bacterial infections (16, 17, 42), whereas Th1 and Th17 provide hosts with protective immunity against such pathogens (17–19) (7, 8, 43, 44). Our data could explain how these pathogenic Th2 responses are induced and amplified in the context of such microbial infections. pDCs circulating in the blood can migrate to their infection and inflammation sites and can thus contribute to the enhanced Th2-type T cell responses. Lastly, it will be important to understand the molecular mechanisms by which signals via hDectin-1 differentially program pDCs and mDCs to control the types of CD4+ T cell responses in different ways. It will be also valuable if this question is addressed in the context of microbial infections as well as inflammatory diseases. Wevers et al. (45) have recently reported that Dectin-1 triggering by fungi activates transcription factor IFN regulatory factor 1 in CD11c+ DCs, which is crucial for IL12A transcription that leads to enhanced Th1 and decreased Th2 responses. In addition, it is also of note that another Syk-coupled lectin, Dectin-2, expressed on myeloid DCs can promote Th2 responses through the generation of Cys-LT (27). However, curdlan treatment on pDCs did not increase Cys-LT secretion. This supports that the enhanced Th2 response by hDectin-1–activated pDCs is largely dependent on OX40L. In summary, this study provides novel and opposing functions of hDectin-1 expressed on the two major human DC subsets, pDCs and mDCs; hDectin-1 expressed on pDCs promotes Th2, whereas hDectin-1 on mDCs decreases Th2. Data from this study bring new insights into the regulation of induction and activation of human CD4+ T cell responses both in healthy and in Th2-associated diseases, particularly in the context of the presence of Dectin-1 ligands. We thank the FACS Core, the Cell Processing Core, and the Luminex Core at Balyor Institute for Immunology. We also thank Dr. Carson Harrod and Jerome Ellis for careful reading and editing of the manuscript. This work was supported by grants from the National Institutes of Health (1R21AI101810-01 and AI057234). The sequences presented in this article have been submitted to GenBank (http://www.ncbi.nlm.nih.gov/Sequin/acc.html) under accession numbers AF400595 (βGRA), AF400596 (βGRB), AF400597 (βGRC), AF400598 (βGRD), AF400599 (βGRE), AF400600 (βGRF), AF400601 (βGRG) and AF400602 (βGRH).
. 2004. Self- and nonself-recognition by C-type lectins on dendritic cells. Annu. Rev. Immunol. 22: 33–54.
. 2006. DC-SIGN ligation on dendritic cells results in ERK and PI3K activation and modulates cytokine production. Blood 107: 3950–3958.
. 2009. A homozygous CARD9 mutation in a family with susceptibility to fungal infections. N. Engl. J. Med. 361: 1727–1735.
. 2014. 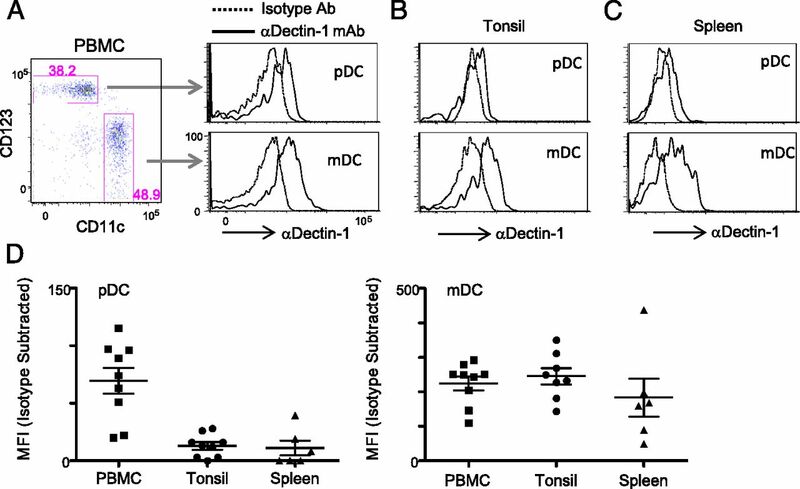 Induction and Activation of Human Th17 by Targeting Antigens to Dendritic Cells via Dectin-1. J Immunol. 192: 5776–5788.
. 2012. Targeting self- and foreign antigens to dendritic cells via DC-ASGPR generates IL-10-producing suppressive CD4+ T cells. J. Exp. Med. 209: 109–121.
. 2010. Differentiation of effector CD4 T cell populations (*). Annu. Rev. Immunol. 28: 445–489.
. 2012. Lung dendritic cells in respiratory viral infection and asthma: from protection to immunopathology. Annu. Rev. Immunol. 30: 243–270.
. 2011. Lung dendritic cell-epithelial cell crosstalk in Th2 responses to allergens. Curr. Opin. Immunol. 23: 772–777.
. 2000. Dendritic cells discriminate between yeasts and hyphae of the fungus Candida albicans. Implications for initiation of T helper cell immunity in vitro and in vivo. J. Exp. Med. 191: 1661–1674. 1999. Immunity to Candida albicans: Th1, Th2 cells and beyond. Curr. Opin. Microbiol. 2: 363–367.
. 2007. Interleukins 1beta and 6 but not transforming growth factor-beta are essential for the differentiation of interleukin 17-producing human T helper cells. Nat. Immunol. 8: 942–949.
. 2010. Concomitant activation and antigen uptake via human dectin-1 results in potent antigen-specific CD8+ T cell responses. J. Immunol. 185: 3504–3513.
. 2005. The human beta-glucan receptor is widely expressed and functionally equivalent to murine Dectin-1 on primary cells. Eur. J. Immunol. 35: 1539–1547.
. 2002. The beta-glucan receptor, dectin-1, is predominantly expressed on the surface of cells of the monocyte/macrophage and neutrophil lineages. J. Immunol. 169: 3876–3882.
. 2012. Dectin-1 is an extracellular pathogen sensor for the induction and processing of IL-1β via a noncanonical caspase-8 inflammasome. Nat. Immunol. 13: 246–254.
. 2009. Dectin-2 recognition of house dust mite triggers cysteinyl leukotriene generation by dendritic cells. J. Immunol. 182: 1119–1128.
. 2011. Dectin-2 mediates Th2 immunity through the generation of cysteinyl leukotrienes. J. Exp. Med. 208: 593–604.
. 2001. Characterization of the human beta -glucan receptor and its alternatively spliced isoforms. J. Biol. Chem. 276: 43818–43823.
. 2009. Dectin-1 directs T helper cell differentiation by controlling noncanonical NF-kappaB activation through Raf-1 and Syk. Nat. Immunol. 10: 203–213.
. 2014. Reprogramming tumor-infiltrating dendritic cells for CD103+ CD8+ mucosal T-cell differentiation and breast cancer rejection. Cancer Immunol. Res. 2: 487–500.
. 2014. Dectin-2 regulates the effector phase of house dust mite-elicited pulmonary inflammation independently from its role in sensitization. J. Immunol. 192: 1361–1371.
. 2003. T cell accumulation in B cell follicles is regulated by dendritic cells and is independent of B cell activation. J. Exp. Med. 197: 195–206.
. 2008. Plasmacytoid dendritic cells: sensing nucleic acids in viral infection and autoimmune diseases. Nat. Rev. Immunol. 8: 594–606.
. 2009. Complement receptor 3, not Dectin-1, is the major receptor on human neutrophils for beta-glucan-bearing particles. Mol. Immunol. 47: 575–581.
. 2014. Neutrophils sense microbe size and selectively release neutrophil extracellular traps in response to large pathogens. Nat. Immunol. 15: 1017–1025.
. 2009. Characterisation of myeloid receptor expression and interferon alpha/beta production in murine plasmacytoid dendritic cells by flow cytomtery. J. Immunol. Methods 350: 106–117.
. 2001. Cloning of human DECTIN-1, a novel C-type lectin-like receptor gene expressed on dendritic cells. Immunogenetics 53: 288–295.
. 2006. Thymic stromal lymphopoietin in normal and pathogenic T cell development and function. Nat. Immunol. 7: 709–714. 2010. Control of immunity by the TNFR-related molecule OX40 (CD134). Annu. Rev. Immunol. 28: 57–78.
. 1996. Chronic mucocutaneous candidiasis. I. Altered antigen-stimulated IL-2, IL-4, IL-6 and interferon-gamma (IFN-gamma) production. Clin. Exp. Immunol. 105: 205–212.
. 2009. Human dectin-1 deficiency and mucocutaneous fungal infections. N. Engl. J. Med. 361: 1760–1767.
. 2014. Fungal engagement of the C-type lectin mincle suppresses dectin-1-induced antifungal immunity. Cell Host Microbe 15: 494–505.